All names, logos, service marks, and trademarks appearing in this Website, including the trademarks, service marks, brand identities, characters, trade names, graphics, designs, copyrights, trade dress, and all other intellectual property ("Content"), except as otherwise noted, are protected intellectual property of, or used with permission or under license by, Food Should Taste Good and its affiliates. This includes the entire Content of the Website, copyrighted and protected as a collective work. 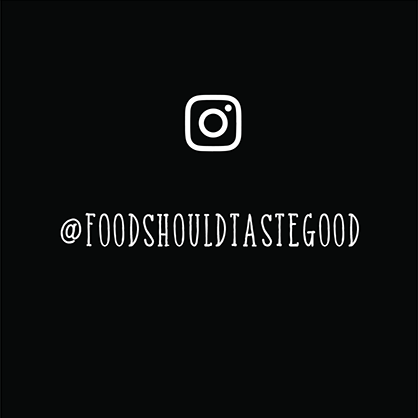 It is Food Should Taste Good’s policy, in appropriate circumstances and at its discretion, to disable and/or terminate the accounts of users who may infringe or repeatedly infringe the copyrights or other intellectual property rights of Food Should Taste Good and/or others. This Website may allow users to post text, images, audio, video, links to other sites, or other content to the Website. As a consequence, you may see materials that have been submitted to this Website by individuals not affiliated with Food Should Taste Good. Neither Food Should Taste Good nor any of its affiliates endorses these individuals nor are we in any way associated with any of the materials that they may post on this Website or link to from this Website. Neither Food Should Taste Good nor its affiliates (nor their respective officers, employees, or agents) shall have any responsibility or liability of any nature whatsoever arising in connection with any materials provided by these individuals or in connection with any conduct of these individuals. You may contact us via our Feedback Form with any comments.